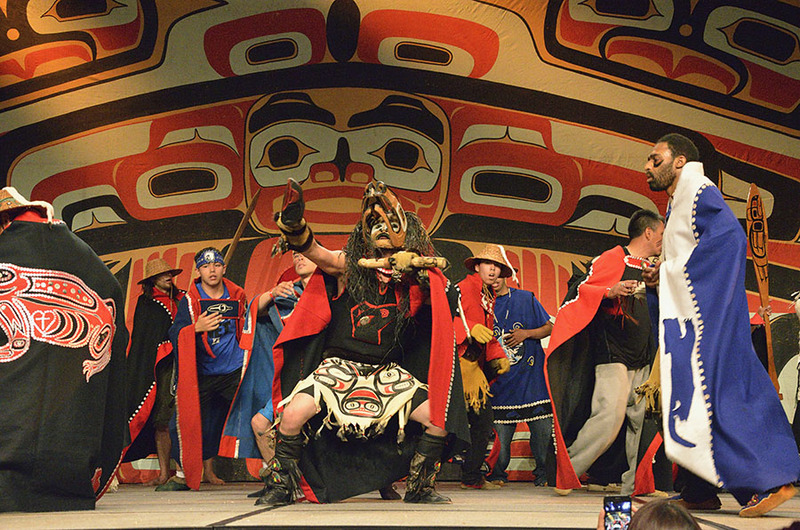 There were so many sights and sounds at the Native Celebration events that I hope you’ll indulge me by letting me show some more photos and video. 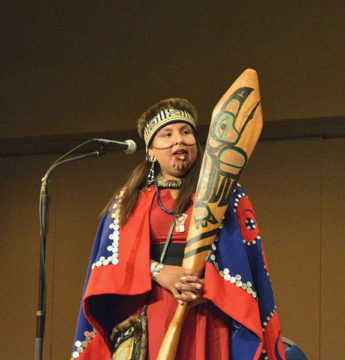 There were a couple of groups who traveled to Celebration in traditional canoes – of the groups we saw, one came from Hoonah and another traveled about 300 miles. Notice that each paddle is customized with designs – that’s to tell other people as well as the creatures in the sea who you are. 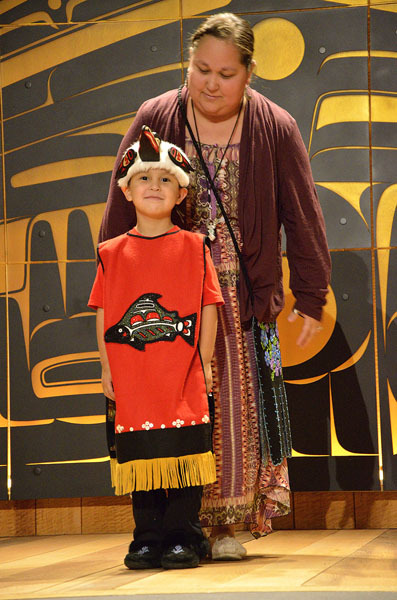 Your paddle shows things about you – your moiety, clan, and/or house. 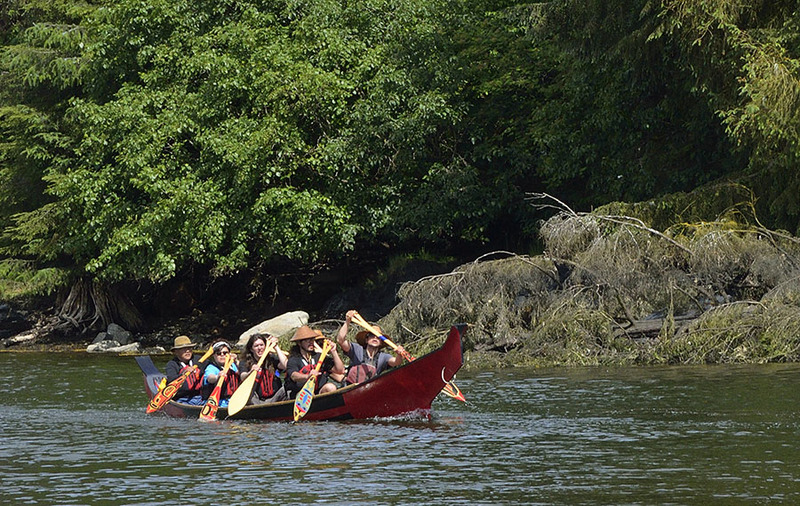 One of the gals from the 300 mile trek talked about “canoe journeys”, and how they are a very challenging but marvelous way to rediscover one’s roots by traveling as their ancestors did, sleeping rough, dealing with weather and strong tidal currents. 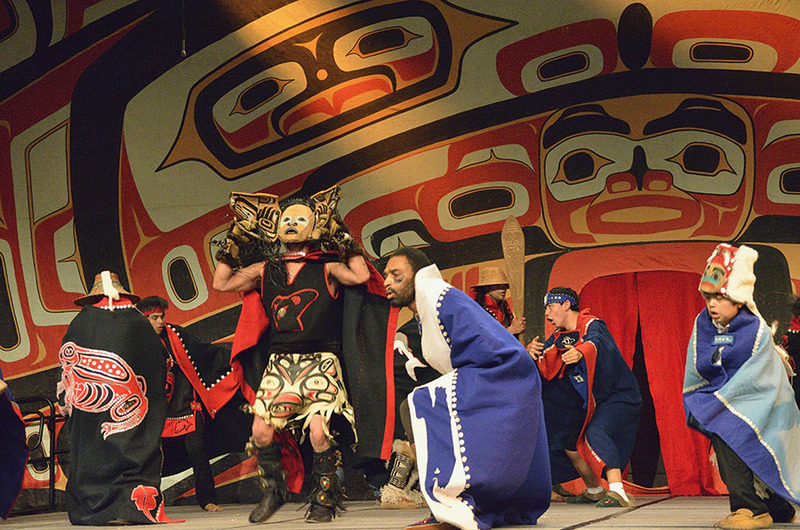 It’s like an Outward Bound experience, only with richer, more personal cultural foundations. 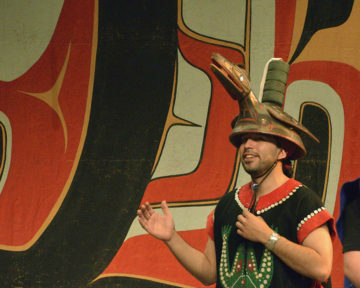 Each dancer’s regalia is a lovingly created means of personal expression, combining their moiety, clan, and house symbols in unique ways. Button blankets are common, often using buttons made from abalone shell. 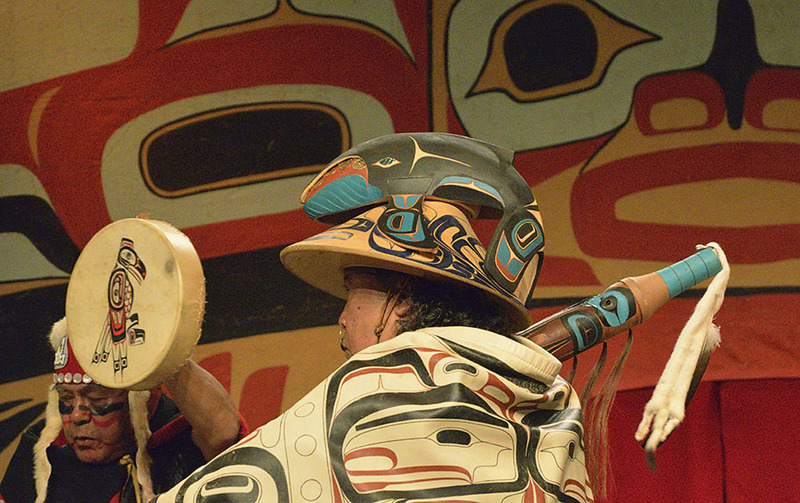 You see lots of ravens and eagles – those represent the two moieties of the Tlingit people. 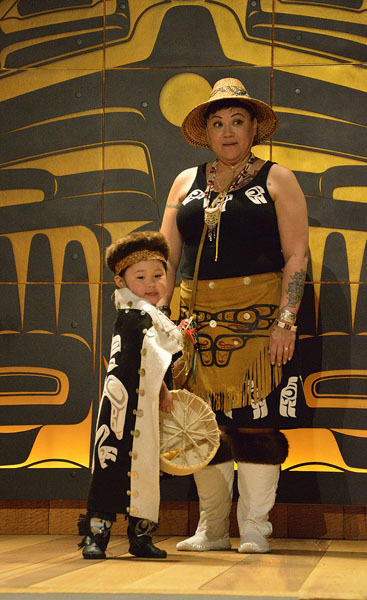 The culture is matrilineal, following the moiety of the mother’s side of the family, and it’s traditional to marry across moieties. When a person of one moiety dies, the other moiety hosts the funeral – isn’t that a lovely tradition? 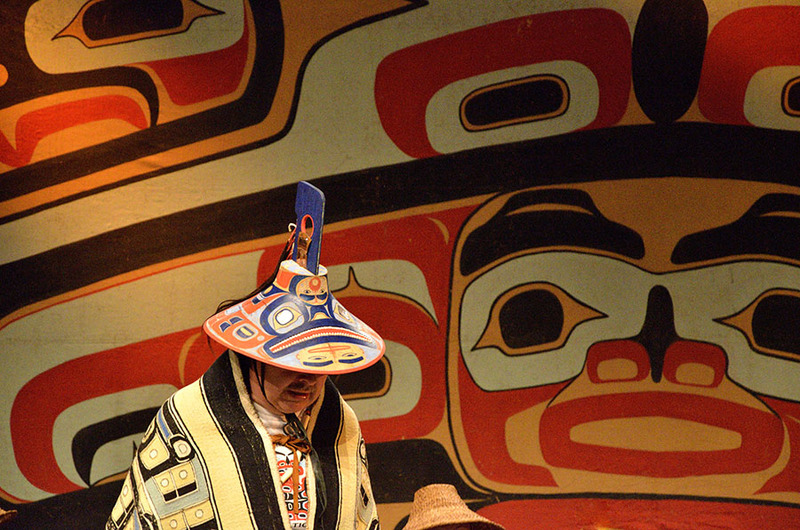 Artful wood carving can be seen throughout the Pacific northwest native communities, but the most clever carving is done to create hats and masks. 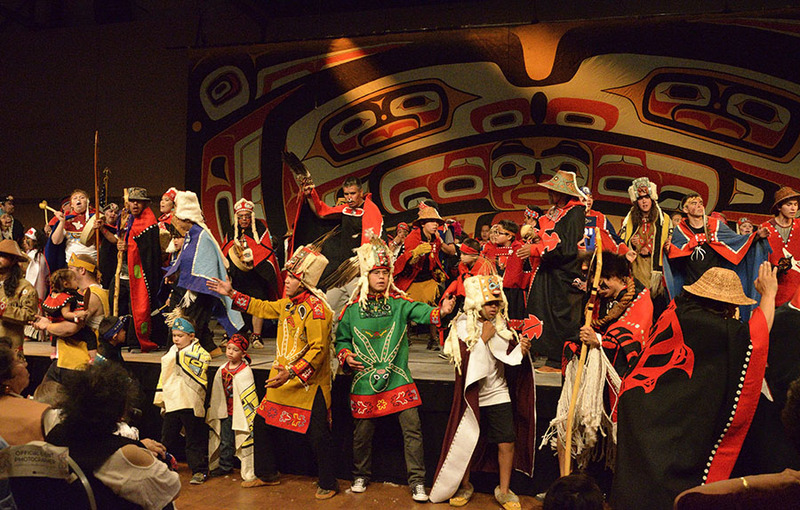 Native art celebrates the creatures that live in their world – the orca, eagle, raven, humpback, salmon, seal, sea lion, frog, bear, wolf, beaver as well as fanciful creatures like the thunderbird. 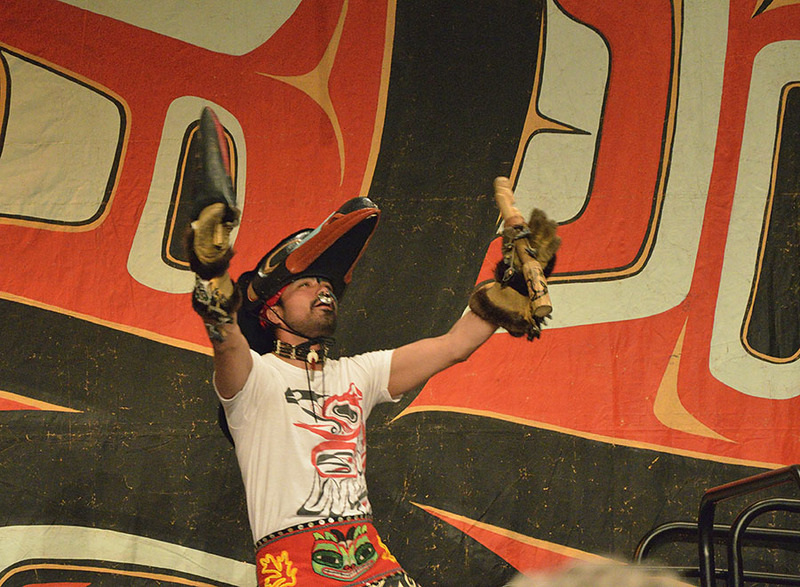 The most wonderful masks are those that can move – a raven’s beak that opens and closes, or a mask within a mask such as this bear mask… …that opens to reveal a man’s face. Notice that even the inside of the mask halves have bear motifs. Each is a masterful work of art. 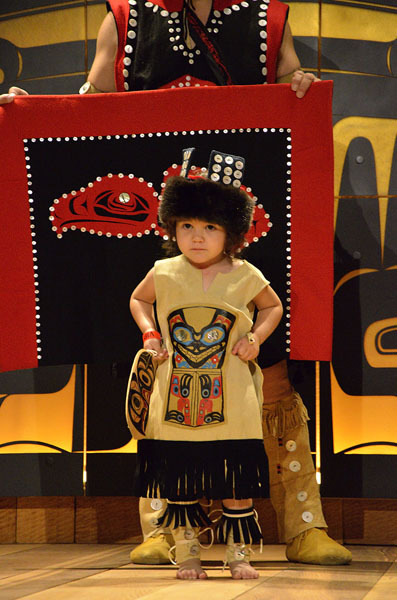 Another Celebration event we enjoyed was the toddler regalia show where tykes ages 2-4 showed off their dancing and ceremonial outfits. 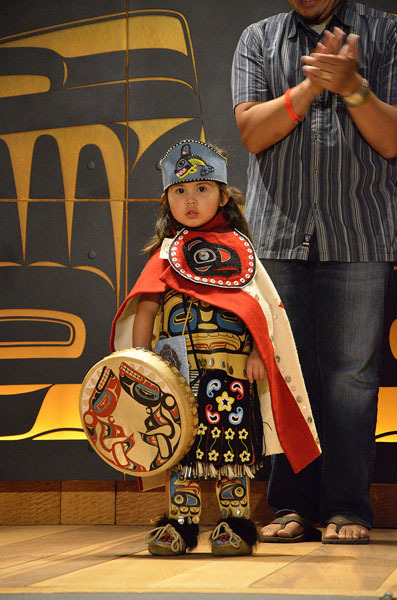 Most of the little ones looked a little “deer in the headlights” when they first came out, but often they warmed up to the audience’s reaction to the narrative describing each piece of their regalia about the materials used, the origin of the designs, and which family member or ancestor made each piece. This fierce little fellow was my favorite. There were contests to see who could whip up the best soapberry dessert, weaving classes, language classes, and an expert available to help anyone with an old piece of jewelry to identify its origins. 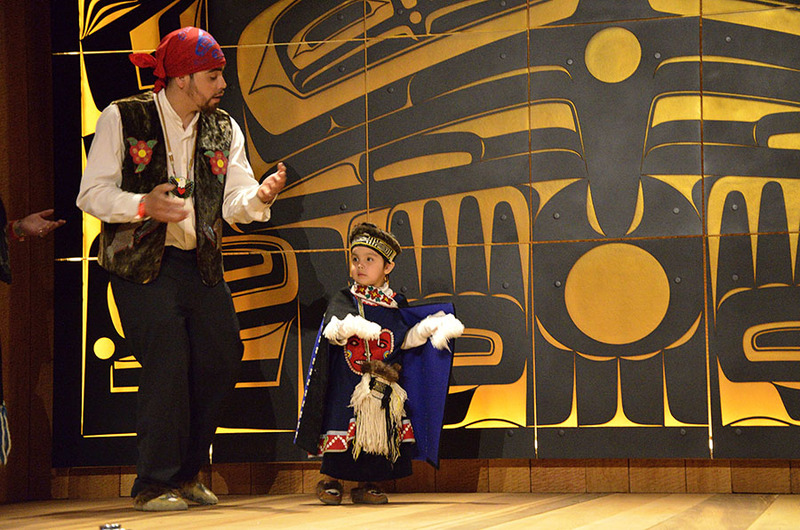 We should all be so lucky to live in a culture so rich with traditions and connections to ancestors and to the world around them. 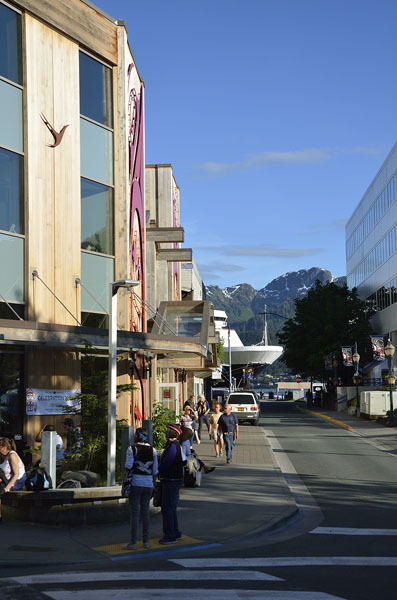 Juneau in summertime swarms with tourists from cruise ships, but this week the hats, vests, engraved bracelets and other native garments colored the landscape with rich meanings, begging to be explored. As we sat at a cafe for lunch one day it was easy to figure out who was a local, who was attending Celebration (so many smiles! ), and who was from a cruise ship. Desultory little clumps of people sitting around a table with their eyes welded to their phones were obviously from a cruise ship… more interested in a bit of WiFi than in the magnificent mountains, history, and culture surrounding them. It’s not to say that all cruise ship tourists are like that, but we do see that bored-grumpy look accompanied by shopping bags full of cheap t-shirts all too often – such a shame. The Summer Solstice marks the first day of summer, which we spent in sweatshirts since it was an overcast day. We have had a lot of nice days with sunshine, and the sun is so strong that it’s almost too hot. The sad thing about the Solstice for those of us who live in these higher latitudes is that from now on we know the days will be getting shorter until late December. Right now we have about 18 hours of daylight, and that will shrink to less than 7 hours before the days will once again grow longer. This entry was posted in 2016 by Robin. Bookmark the permalink.